As I was blog surfing last night, I ran across THIS old post with information about a biography on paper back. I almost passed it by because I honestly don't need to know what's going on in Hollywood, but figured it wouldn't hurt to read what it was all about. Those three little paragraphs, on that little post caught my attention to the point of making me call Barnes & Nobles to see if they had it in stock. A few hours after reading the post, I had the book in my hands. I haven't been this excited about a book in a long time - given with an 18 month old running around, the thought of reading has just made me a bit drowsy lately lol - but the books talks about a healthy lifestyle physically and spiritually (both things that I have struggled with in the past). What does all this have to do with my altered notebook?! lol I'm getting there! Some times when I read books of this sort, I like to not only take notes, but jot down thoughts. So I needed a notebook! My travel theme is not only for my love of traveling, but for a new journey I'm hoping to embark on because you know what they say... "It's not the destination, it's the journey!" Is there a journey you'd like to embark on? Or something you've always wanted to accomplish? Or maybe that "what if" that's always been in the back of your mind? I'd love to read about it, if you have a moment to leave a comment...or shoot me an e-mail! 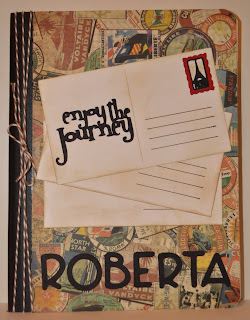 Great notebook, Roberta! Love the background paper. Wishing you luck on your journey and sending you plenty of hugs. Love this altered book. TFS. What a wodnerful book! Love the colors. I recently have been inspired to start a new smash book about my own journey with weight loss. I feel I am at a plateau and that maybe a journal will help me find my pitfalls. Thanks for your post, now i jsut need to get on with my note taking too. BTW, I have a little blog award for you on my blog. Thanks for your inspiration! Thanks for posting about this. I am always so inspired when I see women realizing that they are powerful in so many ways. Good luck on your journey, best of luck! What a great journal! I love the twine on the spine! !